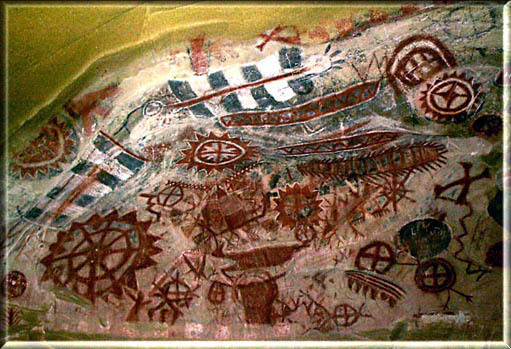 SSMPA occasionally receives questions about local Native American cave paintings or "rock art." This is because many people have heard about the beautiful paintings in the Burro Flats area (Ventura County), and/or about paintings at other Chumash archaeology sites. What most people do not realize is that California is endowed with 100s of rock art sites. Many of these sites are on private property, or are in isolated areas, or are in poor condition. Many sites are not easily accessible, or would not be of interest to the general public. But there are also numerous well-preserved rock art sites which are on public lands, and some of these are available for viewing. Note that there are two main types of rock art: paintings are called pictographs, and carvings and/or pecking on solid rock is/are called petroglyphs. I have picked five of my favorite California WOW! rock art sites, all of which are fairly easy to get to, both by car, and- after you get there- by foot, to describe to you here. The rock art at all of these sites is spectacular and well worth the time and trouble to go see. All of these sites are listed on the National Register of Historic Places. The well-known Chumash Painted Cave in San Marcos Pass, north of Santa Barbara, constitutes California's smallest State Historic Park. Although a little mountain driving is required to get to it, the beautiful drive and the paintings are worth the effort. The walk to the site is literally only a few feet, and the paintings are spectacular. They are one of the largest, most complex, and most colorful pictograph panels in California, and of the major rock art sites in California they are the easiest for the general public to get to. This is a great side trip if you are traveling up or down the coast, or if you like to make day trips it is only some 80 miles from the west SFV. One can get to the Park via Painted Cave Road directly from San Marcos Road, but the road is very narrow and steep, and the view of the area (which is quite beautiful) is restricted by the terrain and by the vegetation. I suggest instead taking the following route: From California Highway 101 in Santa Barbara take San Marcos Pass Road (Santa Barbara 154) north to the top of the Santa Inez Mountains and turn right (east) onto East Camino Cielo Road. Take this very curvy paved road a few miles and you will see a street sign for Painted Cave Road on your right. Take this REALLY curvy paved road a bit over a mile and after a couple of gut-wrenching hair-pin turns in the beautiful oak forest here the road will straighten out and be adjacent to the drainage.... you are now about to arrive at the park.... which is on the hillside above you and on your right. The park is so small that it is easy to miss, so watch out for the park signage next to the road. There is room for only 2-3 cars at any one time. Be ready to say "Wow !" You will be going DOWN Painted Cave Road when you leave, and there is a great view of the Santa Barbara coast as you descend the mountain (this is the reason you came this way.... you can't see the coastal view very well going up). Painted Cave Road will return you to the 154. Go left to return to Santa Barbara; go right to go to the Santa Inez Valley and points north. If you want to locate "the middle of nowhere" I suggest starting the search in the Carrizo Plain, at Painted Rock. The Plains are located in the southeastern-most part of San Luis Obispo County. This is closer than it sounds, if you don't mind driving a bit; my wife and I and friends have visited this site as a day trip several times; the Plains road also makes up part of a nice alternate inland route, if one is coming or going to the central California coast. The Carrizo Plain is especially known for its spectacular spring wild-flower displays, for the wild-life (I drove by a Golden Eagle, sitting by the side of the road, 20 feet away, one time! ), and for being the home of Painted Rock, which is thought to be (or have been) the greatest concentration of pictographs in the United States. Even though the numerous multi-colored paintings have been severely vandalized, there is still much to see, and the site continues to be a remarkable example of California's rock art. To get to the Carrizo Plain and Painted Rock take the California Interstate (5) Freeway north. Continue beyond the Grapevine and a couple of miles past where California Highway 99 splits off from the I-5 you will come to the Maricopa (California 166) Highway. Go west (left) and cross the southern end of the San Joaquin Valley (a real straight shot for about 20 miles). 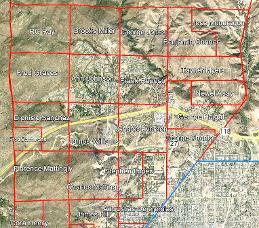 When you reach the "town" (maybe once) of Maricopa, stay on the 166 as it enters the east side of the Coast Ranges. You will gain altitude as the road rises and curves around a bit. In another 10 miles (or so) you will see the ruins of an old gas station and store on your right. This marks the location of Soda Road, which is signed; there is a kiosk just after the turn, which describes the Monument, access, etc. Soda Road varies in condition quite a bit, but any vehicle with decent clearance will do fine. Drive northwest on Soda Road and pass Soda Lake (dry or wet). A few miles beyond Soda Lake you will see signage for the Goodwin Center and Museum, turn left (west) and go to the Center and sign in. The Center has displays and information on the Plains and on Painted Rock, and at some time of the year they provide interpretive tours that you can join. After signing in drive about 1 mile to the parking area. A 2-mile round trip will take you to Painted Rock and back. Be prepared to be amazed ! The largest concentration of petroglyphic rock art in North American is located only a few hours' drive from the San Fernando Valley. A series of petroglyph panels occupies a long narrow wash in the central part of the Naval Air Weapons Station China Lake. The petroglyphs are found on both sides of the wash for about one mile! Many of the petroglyphs are large and interesting (many show shamen and Big Horn Sheep) and there are literally several 1000s. If you only see one rock art display in southern California, this is the one you should see- you will never forget the experience. Seeing ALL of the petroglyphs in this canyon will require about a three mile hike, most of which is fairly easy, but a small amount of "boulder hopping" is required to do the entire hike. Access is by docent-led guided tours ONLY; tours are led by staff from the Maturango Museum, in Ridgecrest. You must make a reservation through the museum and meet at the museum the morning of your tour. After a short orientation, your group will check in at the base and then drive as a group to the tour parking area. Plan on spending an entire day; you can easily make it back to the SFV that evening (although I usually spend the night before the tour in Ridgecrest at the Heritage Inn, so I have time to have breakfast and don't have a long drive on the way out). To get to Ridgecrest and the Maturango Museum take the Antelope Valley (14) Freeway north to and through the Mojave Desert. Continue north to California Highway 178. Take this road east to Ridgecrest.... The Maturango Museum is located at 100 E. Las Flores Avenue. The drive from the museum to the tour parking area takes about one hour. You CANNOT take pictures of the base (no worry- there is really not much to see except for generic scenery, which is nice), but you can take all of the photos that you like of the rock art itself. There are three large concentrations of petroglyphs in the Fish Slough area (north of Bishop in Inyo County); these sites are accessible to the general public. These sites were the first petroglyph sites I ever saw, and are one of the reasons I became interested in the subject. All three sites are next to or close-by a well maintained dirt road that any vehicle with good ground clearance can successfully navigate. Anyone that has gone to Mammoth Mountain, Mono Lake, or June Lake has driven right by the turn-off. Only small amounts of easy walking are required to see these three sites, although it is necessary to get up and into some of the larger boulders to see many of the petroglyphs: PLEASE DO NOT WALK ON ANY OF THE ROCK ART. There are lots of petroglyphs and lots of different designs. Plan on spending at least 1/2 day examining these three rock art sites. To get to the Fish Slough petroglyphs sites take the Antelope Valley (14) freeway north to where it joins California Highway 395 and proceed north to Bishop; continue through town and go to the last traffic light in Bishop. DON'T go left towards Mammoth Mountain (etc. ); continue straight on Highway 6. In just over one mile Highway 6 curves to the east (right). DON'T go that way. There will be a signed dirt road on your left, as Highway 6 begins to curve (to the right). Make the left onto Five Bridges Road, which will soon cross the Owen's River.... This is a great place to take a stretch and a couple of pictures. Just north of the river make a left onto Jean Blanc Road (dirt); follow this 6/10 of a mile to Fish Slough Road (also dirt). Proceed north on Fish Slough Road and you will see signage, parking areas, and interpretive kiosks when you arrive at each site. The drive in is less than 6 miles. When you are done viewing, return to Bishop and Highway 395 the way you came. For anyone visiting the southwest side of the Sierra Nevada Mountains the best place to see rock art is Hospital Rock, where a large panel of well preserved red pictographs can be easily accessed from the General's Highway, after entering Sequoia National Park from the Lake Kaweah/Three Rivers park entrance. There is a parking lot at the site, which is located adjacent to the Middle Fork of the Kaweah River, so the walk is short and easy. Interpretive kiosks explain the history of the site and the pictographs, and there is a picnic area for those that want to linger at this beautiful spot for a few hours. To get to Hospital Rock take the Golden State (5) Freeway north to where California Highway 99 splits off. Follow the 99 north to the General's Highway (California Highway 198) and go east (right) to the Community of Three Rivers (my wife and I always stay at the Buckeye Hotel when we are in this part of the woods). Follow the 198 through Three Rivers and enter Sequoia national Park. After paying the park fee (you get a map, which shows Hospital Rock and the rest of the park) continue into the park and follow the river for a few miles to the Hospital Rock parking and picnic area. Enjoy. There are numerous other rock art sites in California and Nevada that are accessible, if one is willing to drive a bit. There is plenty of information on rock art available on the www, and there are quite a few well-illustrated books available on the subject too, so there is plenty of opportunity for you to do some of your own research and pick some other places to visit. Let us know what you find ! Check it out and enjoy their online presentations, all scrupulously well-documented using primary historical documents. The first on-location Western movie, The Great Train Robbery, was filmed in New Jersey in 1908. 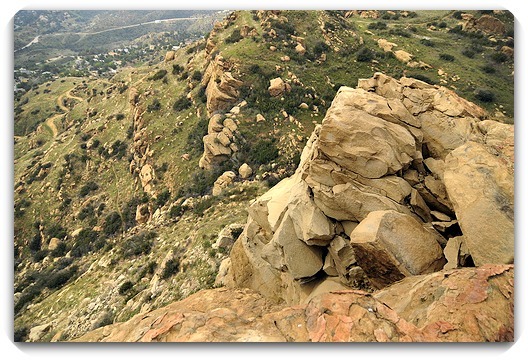 Film producer Cecil B. DeMille, wanting to escape movie industry control by Thomas Edison (inventor of the camera) and to film a Western in the West, eventually found his way to the rugged boulders, chaparral, and raw beauty of the Santa Susana Mountains. DeMille’s first Western, The Squaw Man, 1914, was filmed on location at the Iverson Ranch, just northwest of Chatsworth, California. This led to the filming of thousands of films, Western movies (oaters), non-Westerns, Academy Award winning films and actors, and TV episodes in the northwest corner of the San Fernando Valley for over 80 years.